Vancouver native Kyle Nguyen started wrestling near the end of grade nine, seeking to make a lifestyle change. Overweight throughout his childhood, Kyle sought to become fitter and healthier, and after encouragement from those around him, he became committed to – and quickly fell in love with – the sport of wrestling. After making steady progress throughout his first two years in high school, Kyle made his wrestling breakthrough in grade 11. Competing at Fila/Cadet trials against well-established and more experienced athletes, Kyle finished second overall, securing himself an alternate spot on the Cadet National Team. Upon graduation from John Oliver Secondary School, Kyle was approached by University of Winnipeg Wesmen coach Adrian Bruce, and signed on to begin at the University of Winnipeg in the fall of 2012. Kyle’s excellence has continued through his four years as a Wesmen, and recently had the opportunity to compete at the 2016 Olympic Trials, an experience he said was incredible and reaffirmed his future goals. Despite competing as individuals, Kyle says a program’s strength lies in the strength of the group. Eventually, Kyle hopes to compete at wrestling’s highest level: the Olympics. VANCOUVER COURIER (May 18) John Oliver Joker Kyle Nguyen will be a Wesman in September. The high-achieving captain of the high school wrestling team committed this week to the University of Winnipeg. 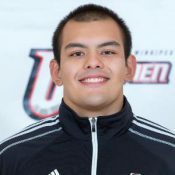 WESMEN ATHLETICS (May 6) Wesmen Men’s Wrestling Head Coach Adrian Bruce Announced Today The Commitment Of Kyle Nguyen (Vancouver, BC) To The Men’s Wrestling Program.